After several tries, I was able to make a non-stop flight from Clocktown to Whittington, roughly ~26km. I had to increase Java's memory allocation to do it as I kept running into the cap and freezing/crashing. This is pretty close to the limit for single-elytra endurance, even with unbreaking 3. I've done some proof-of-concept in-air elytra swaps though, so longer flights are definitely possible with additional elytra. I guess now that I'm here, I'll start working on my Arcology project, would be nice to have easier access to the resources I've built up at the Clocktown technology test facility than a 25 minute elytra flight though. Speaking of connections, I tried another type of map using Whittington as example, but I'm not sure I like the result. What I actually want probably dives deep into the functionality of map tools similar to Open Street Map, which isn't feasible to use here1. 1 Basically, a geographical map probably auto-generated by the ingame map tool or better yet the Tectonicus map. Overlayed over that is an interactive layer where points of interest can be defined and on hovering over their icons additional info is displayed (like what crafting stations are available etc.). Another layer displays the various transportation systems as a topological map with the nodes on their actual geographical location. Another layer could auto-generate a lighting map to display weaknesses in an area's monster defense. The Metrorail in Whittington is alive and well, but I have no idea where we'd get the 5625 iron ingots necessary for a railway from Whittington to spawn. Unless there's an existing railway connection closer than spawn, but if I remember correctly from my survey, the best we could do is to connect to the broken rail from the Racing Track to Roosevelt Airport, which still is a 14k line or so. It's probably better to go for either a nether rail or build an airport and request a flight connection. However, we could also construct a port at Whittington and open the first shipping line, which thematically hide a command block teleport just like the airplane/zeppelin lines, provided a mod likes the idea and sets up the actual connection. 5625 iron ingots is only 10 stacks of iron blocks, which wouldn't make a too big a dent. However, I like the airport or shipping line idea better. Building that long of a rail suuuuuuucks, even if you have the material. I built the whole winterfell >> spawn line, and the one to the mountain fortress, and it is tedious. This was before the airport though, and the neither rail was the only way to pandora. oscar_spider wrote: 5625 iron ingots is only 10 stacks of iron blocks, which wouldn't make a too big a dent. However, I like the airport or shipping line idea better. Make that some 18 stacks for double-track directed powered railway. But yeah, for all indents and porpoises it's better to have a teleport station. raudorn wrote: Speaking of connections, I tried another type of map using Whittington as example, but I'm not sure I like the result. What I actually want probably dives deep into the functionality of map tools similar to Open Street Map, which isn't feasible to use here1. What you're describing sounds like easy stuff with the GMaps API that is used in Tectonicus. I'll try and fiddle with the API soon. It feels a bit cramped though; the platforms should probably be a bit longer and the passage to different platforms should probably go beneath the tracks. There are only 4 translations because I'm not familiar with more languages (and the arch is only 4 blocks wide); I'm not even that happy with the french name. In importanter news: yesterday's map render is here! Yesterday as in 2016-09-16; the old map is now available at /old-map. I accidentally the orientation, so north is to the right for now and the nether only shows the bedrock roof and especially the overworld could use some more zoom levels. The best gold farm I've used is the one in the Nether somewhere on our server, though I understand it's nerfed now that nothing spawns on pressure plates. The third best is one I built, but it's not very good at all, and uses a lattice of the old standard 2x3 portals in a 3d grid. Here's a picture, such as it is. There are probably better designs out there. Ignore the stuff on the sides; just iron farms integrated in to it. I didn't build this, but I use it. So if I understand nether portal and zombie pigman spawning mechanics correctly, the only factor we really care about is the bottom edge of the portal. So a more-optimal design would use shorter portals, and stack them on top of each other. That could be totally wrong, but I'm definitely gonna try it out. Zombie pigmen have a chance to spawn on the bottom frame of the portal in the Overworld if any nether portal block above receives a block tick. Note the bolded. So it's not just the bottom edge that matters, all the portal blocks above increase the chances of spawn. Therefore the most efficient design (obsidian usage and space wise) is the biggest possible portal, 23x23. I've built a farm that is 12 of these portals, and it takes 8 hours to make a stack of gold ingots, however it's right under my castle where all my farms are (and no doubt lots of unlit caves nearby) so it would no doubt generate a lot more up in the sky or something. Feylias wrote: The best gold farm I've used is the one in the Nether somewhere on our server, though I understand it's nerfed now that nothing spawns on pressure plates. After I realized the gold farm in the nether was no longer functional I briefly thought about converting it from a pressure plate plate trigger to a trip-wire trigger. Certainly doable. Instead I opted for a simple non-AFK design at my Ghast hunting stand which is nothing more than a murder hole just below ground level. The main appeal was that it also generates XP for repairing my gear enchanted with Mending during the downtime when waiting for Ghasts to spawn. Aww, you can see where my big rail to winterfell got broken. I wonder what did that, it's not even a full chunk sometimes. I might log in just to build something there. According to xkcd.flumble.nl/status (yay, see if there's anyone to hang out with before firing up minecraft), we have a very active server: it's populated for a whole 8 hours a day during the week! Why does no one play this game anymore? Flumble wrote: According to xkcd.flumble.nl/status (yay, see if there's anyone to hang out with before firing up minecraft), we have a very active server: it's populated for a whole 8 hours a day during the week! I was on a lot and frequently the only one for long stretches, but others popped in and out. Recently I took a temporary break while playing No Man's Sky. The graph is interesting, but it would also be interesting to know who has been active recently. Perhaps even though mostly only 1 player is on at a time it might be that it's several players who just aren't overlapping in time. I know Zephyr and I overlapped frequently a month or so ago. Edit: I just tried to get on now at the server appears to be down. oscar_spider wrote: The graph is interesting, but it would also be interesting to know who has been active recently. Perhaps even though mostly only 1 player is on at a time it might be that it's several players who just aren't overlapping in time. I know Zephyr and I overlapped frequently a month or so ago. From my own overlap I can tell Edgar has been online a lot and raudorn and ganalef too (though less or with less overlap with me). We'd need _infina_ to enable the "query" setting to automatically query who's online. The sentiment "no one" was simply a childish "people should play what I play". And the fact that there are hundreds of avatars on the map and still plenty of active forumites, but only a dozen or so people have visited the server this whole year. ...and then there's feylias who keeps crashing the server so no one can join. This area. I bet it's pretty fun where the chunks cut, big cliffs overhanging over the lake. Flumble wrote: ..and then there's feylias who keeps crashing the server so no one can join. I think I'm going to have to make a series of cobble segments on the grass, and use enchanted diamond hoes and shovels to de-grass them. Of course, when I'm done, I'll still need to build a dry cobble sky and then cut off the water flow. when I connect it all up. That'll be a doozy of a big deal, and I'll also be cutting off the water flow on the outer edges. This'd be affecting up to a thousand meters distance on the edges and at least . With my current free time being so intermittent, though, I don't see it happening soon. Maybe when that time comes I can find a way to help get the server some extra processing "oomph"
EDIT: Server's back up. I'll avoid logging on until the weekend at earliest; suspect water may still be moving even if I don't touch the stuff at all. Flumble wrote: We'd need _infina_ to enable the "query" setting to automatically query who's online. Take the "query" results of who's online and add the names to the graph - now that would be useful. I have been working a bit on the Whittington port. That thing there is supposed to be a ship... I happily accept better designs. The next step is making a counterpart near spawn. I think I'll extend Redstone Harbour near Castle Clavey instead of making a new port. Then there is the question of who actually has mod rights for the command blocks. We could do that, but the USS Nimitz is already an airplane hub, so there might be some confusion there. Maybe instead the USS Roosevelt1? Or better yet, the I'm-not-sure-the-ship-has-a-name docked at Upsulla, since I don't think an aircraft carrier can dock at Whittington or would even bother with some small cargo port. That would also have the added benefit of bringing some tourists to Upsulla and the Western Hub, plus adding a minor inconvenience to traveling between Spawn and Whittington, which avoids the whole "Why don't we just use warps?" issue. 1 It sits in a bay near Spawn, accessible via rail departing from Grand Central. Why are there trees growing on that boat? I waited until nobody else was on late on Sunday, set all settings to minimum, logged in, fled the area where the water was updating. I was in the process of putting a port + ship at winterfell, when my activity dropped off. I'm afraid I don't have a computer that can handle minecraft right now, or at least, not handle it without me getting overly frustrated with it. I'm in the process of building a new desktop though, and so I'll likely be on again after that. It might not fit the theme, but have you thought of using Shovels to turn the grass into grass paths? Granted it's not as bleak as dirt. Using coarse dirt would also work. oscar_spider wrote: Have you thought of using Shovels to turn the grass into grass paths? Granted it's not as bleak as dirt. Using coarse dirt would also work. Surprising thing about grass paths (and farmland) is that monsters won't spawn on it (and Endermen can't grab it.) I can still use it as a barrier around grass and then clear the grass and then till the path, but it's not very efficient. Coarse dirt would be pretty good, but would be expensive to gather and place. It's a good idea for around the outside of Mordor, however. I'll use it for that to limit grass incursions from without after I turn off the external waterfall. This means that at a maximum I have a water cube of 24x24x50, which is low-impact for the server. It's a lot more problematic to ensure I don't allow any small but spreadable (light glitches) grass patches (especially between the squares; there's necessarily a 1m gap between them all), but with luck there will be very few grass patches and maybe they won't be near nurturing light glitches. Eventually I'll have to kill the water mountains of the past. I'll see what I can do to mitigate the trouble those might cause. Perhaps killing them bit by bit when possible. The worst will be the water wall around the edge of Mordor. I've been told that it's not a bad aesthetic, but I want people on the perimeter to be able to see in. I think I'll use grass paths around the perimeter, actually. I did not notice until this week that Minecraft creative gives worldedit capability now. Vanilla creative just became fun and interesting. Would any of you mind if the server were switched to Hard? Right now, I think, it's set to Easy. If nobody minds, maybe we can ask Infina to upgrade. Feylias wrote: Would any of you mind if the server were switched to Hard? Right now, I think, it's set to Easy. If nobody minds, maybe we can ask Infina to upgrade. I'm in favour with only one demand: that a teleport between the Whittington harbour and some other harbour (e.g. Fort Upsulla like raudorn put forward) finally be added. Hey everyone, sorry for the slightly 'noob-ish' question! 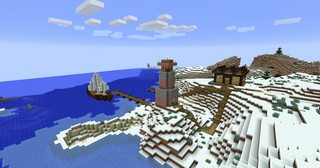 I was just wondering if anyone could offer a bit of advice about setting up a Minecraft server? I'm afraid I don't really have any experience with it! I've been considering going down this route mainly to serve a core group of my friends and friends of friends (around 15 people), just so we can have more control over our playing conditions, have our own space to hang out and play together... that sort of thing. That said, it would also be great to invite quite a lot more players from time to time, depending on what we feel like playing. Thing is, I don't know what sort of option I should be looking at for this sort of size. I was reading this blog post from 1&1 about dedicated root servers and it sounds like it would be easy enough to do, but I'm not sure whether my plans are large enough to justify setting one up. Perhaps a cloud server instead? - Would a dedicated server be appropriate for our needs? - If not, could you recommend anything better suited? 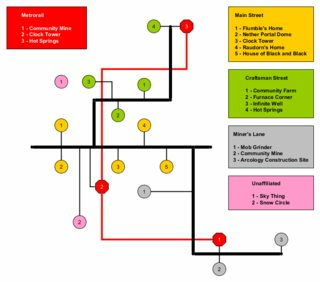 Are there more places of interest that should definitely have a detail view? siloguist wrote: just so we can have more control over our playing conditions, have our own space to hang out and play together... that sort of thing. As in: have you tried Realms? (there's a free trial) It doesn't support mods, but it allows you to swap maps/gamemodes with ease. And it's white-list based, so people can join as soon as you've invited them. Note that there is a maximum of 11 concurrent players, and I have no idea how many of your 15 friends will be online at the same time (I'd say at most half of them, but I don't know how serious you are about playing together), so maybe you'll be bothered by that limit. In any case realms has the benefit of not needing any setup of a dedicated/virtual server and finding the right type of server and it's a bit cheaper than your average dedicated server (precisely because it's targeted at running a game instead of being a general purpose computer). I confirmed that it is currently set to easy via how much damage a Zombie did to me. My recollection is that it used to set to hard. Perhaps it changed when it got moved. I checked in on the server and saw the new additions to Whittington. Well, someone has been busy! We should have an award for architecture or something. As I'm currently not playing much Minecraft (interest waxes and wanes), I give permission to everyone to raid any of my supplies. It's not overly much, but could save some mindless mining/grinding. Notable stores include Main Street 2, my compartment in the Bottomless Chest, some wooden products in the harbour warehouse and of course Black Forest back in the Old World. The arcology really is a blessing. Easy access to mending books and all the efficiency upgrades and an endless supply of food items to trade for XP. Perhaps an XP farm would do better, but repairing diamond tools only takes a couple of minutes via trading with the farmer. I have built a Viking ship named the Asgerd Asketill near Plains City to be part of the Harbor Transportation system. Please have teleports to here arrive on the dock at coordinates -16530,64.5,-7600. They have been added. I did not add signs yet. _infina_ wrote: They have been added. I did not add signs yet. I don't see the transport from the Viking ship Asgerd Asketill to the hub. Did you only set up the out bound from the Hub? Button on the wood block at the center of the ship.